Say Goodbye: The Laurie Moss Story, Lewis Shiner, St. Martins, 1999, ISBN 9780312241100, 245pp. Like many others, I once imagined a world where I was a famous rock star. In high school I wrote songs at the permanently out-of-tune upright piano and Casio keyboard my parents had purchased for me. I even joined a band for a brief shining moment (one ‘gig’ only). But most of my music career was in my imagination, which I indulged by crafting an entire persona complete with transparent pseudonym (Gil Chase), a wish-fulfillment history and albums complete with titles, tracklists and lyrics. At one point in college, I attempted to turn it all into a short story. I am not unusual in this, as the allure of fictional rock bands has nearly become a sub-genre in fiction, including books such as Iain Banks’ Espedair Street, George R.R. Martin’s The Armageddon Rag, and Roddy Doyle’s The Commitments and movies such as Alan Parker’s adaptation of Doyle’s novel and Cameron Crowe’s Almost Famous. Although the real stories of rock bands have plenty of drama, an entirely fictitious creation allows the author to emphasize a particular theme that history might obscure. Such is the case with Lewis Shiner’s Say Goodbye, a meticuously crafted fiction about a female rocker in the mold of Sheryl Crow or Edie Brickell. 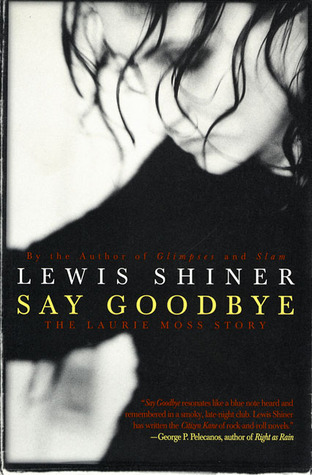 Shiner, who had previously shown a deep understanding and connection to the music world in his award-winning previous novel, Glimpses, creates his star, Laurie Moss, out of his own small-town Texas experiences and dreams while also distancing himself from the subject by a gender-switch thinly veiled stand-in jounalist narrator. The supporting band cast are convincingly individuals and not just foils to Laurie. While the main plot centers on Laurie’s LA musical experience, from opening act in small bars and waitressing in coffee shops through a finished debut album and first tour, it is the framing tale of the narrator’s search for the woman behind that song he heard on the radio that has a kind of revealing pathos for those of us for whom music is life-affecting. The book has two climaxes–one for Laurie and one for the narrator–both of which are not exactly the neat little endings of dreams but the bittersweet half-conclusions of life. Reading Shiner’s in-progress auto-biographical essay at his website fleshes in some of the details of the lives of all his characters. While not necessary to enjoy the novel, the essay provides a rare glimpse behind the art, like knowing that Sting was a high school teacher before becoming the leader of the Police and singing about a “young teacher the subject / of schoolgirl fantasy.” Like much of the best art, Say Goodbye comes from Shiner’s real experiences, filtered into order and meaning from which the reader can obtain much more than a simple story or song. This is the kind of book that makes you as interested in the person behind it (hence my visit to his web site and his essay), although at the same time it warns you about creating false pictures of that person based on your own hopes and dreams. I feel the need to throw in a final comment as a disclaimer: I know Lew Shiner, having spent time discussing writing with him both as a student and a peer, as well as drinking a beer or two with him. Even though I haven’t talked to him in years, I count him as an acquaintance and quite possibly a friend. I do not feel this colours my impression of this book, although it might be why I found the things not written as interesting as the things present in the text.